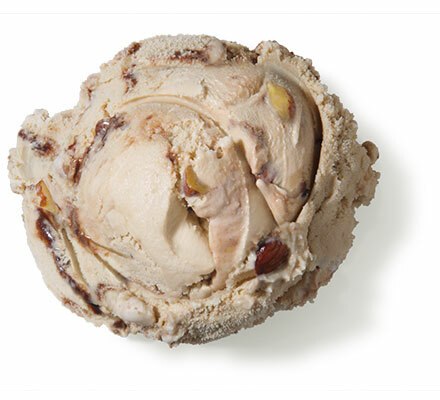 Mocha ice cream with thick swirls of fudge and crunchy almonds. Ingredients: Milk, Cream, Buttermilk, Whey, Corn Syrup, Fudge Ribbon (Corn Syrup, Sugar, Water, Palm Oil, Cocoa Processed with Alkali, Unsweetened Chocolate Processed with Alkali, Pectin, Mono & Diglycerides, Polysorbate 80), Almonds (Almonds, Canola Oil, Salt), High Fructose Corn Syrup, Sugar, Skim Milk, Contains 2% or Less of Coffee Extract, Guar Gum, Cellulose Gel, Cellulose Gum, Carrageenan, Carob Bean Gum, Mono and Diglycerides, Polysorbate 80. Allergen Information: Contains Almonds, Milk.